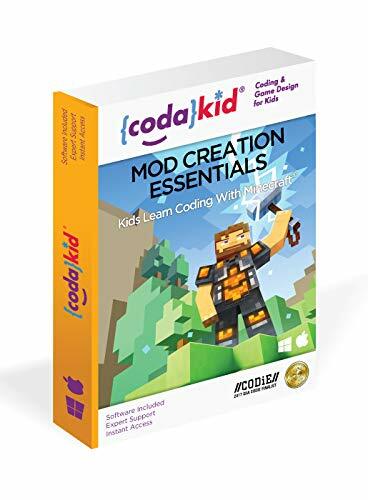 In this one year subscription, Mod Creation: Essentials teaches kids how to code in Java while creating exciting custom mods for Minecraft. Our self-paced, online course is designed for students ages 7 to 15 and can be taken anytime on a schedule that works for you. Students use their creativity to design and code a custom axe that shoots fireballs and a shield that throws enemies into the air. While learning how to code using professional programming tools, students receive valuable instruction on methods, variables and a variety of other coding concepts that are designed to help them learn how to code independently. CodaKid uses fun breakout videos to explain coding concepts with fun graphics and animations - all in a way that kids can understand. Our learning platform also features fun quizzes that allow students to earn points, and these points can be used to gain access to special bonus mods. We use Minecraft version 1.12.2 to create our custom mods in Minecraft. If students ever need assistance, they can reach out to our friendly online instructional team who will help them every step of the way. Students have access to our online teachers for 12 months via email or screenshare. CodaKid students write real code using Java, one of the most popular programming languages in the world. We use professional grade tools and provide kids with real transferable skills. We do not employ drag and drop interfaces or copy/paste instruction. What Integration Trends Should Federal Agencies Embrace to Ensure Mission Success? Are Legacy Systems Really Hampering Federal Agencies? Is An Innovation Contest What Your IT Team Needs Now? Manage research, learning and skills at IT1me. Create an account using LinkedIn to manage and organize your IT knowledge. IT1me works like a shopping cart for information -- helping you to save, discuss and share.